Time's Seoul correspondent Michael Schuman praised South Korea for its economic development in his opinion piece posted on March 24, 2010 on Times website's business section. He argued that Samsung, LG, and Hyundai of South Korea, poorer than Iraq a half century ago, now doing better than Japanese counterparts in economies of BRIC (Brazil, Russia, India, and China). He also pointed out that South Korea's ecnomic growth was achieved through liberalization and internationalization. Here is the Time story. I'm writing this post from Seoul, South Korea, a city that holds very special meaning for me. Seoul was my first full-time overseas assignment as a foreign correspondent (for The Wall Street Journal), and I spent almost five years here, intensely immersed in the history, economy and culture of this fascinating nation. I used to joke I lived in Korea long enough to distinguish between different styles of kimchi (and have favorite ones, no less). The city has changed quite a bit since I moved on more than nine years ago, but I will always have a connection to the place. I met my wife here, and every time I return, I feel almost like I'm coming home. Unfortunately, too few foreign journalists and economists have had the good fortune of such an in-depth experience with South Korea. Korea often gets lost in all of the noise about Asia's giants, China, India and Japan. Those who do invest the time to study the place usually zero in on its six-decade face-off with Communist North Korea. And that's a shame, since Korea has always offered priceless lessons in economic development, and continues to do so today. Lesson One: If Korea can do it, any country can. Sitting in a (surprisingly pricey) Starbucks in downtown Seoul, surrounded by modern office towers and Hyundai-clogged streets, it's impossible to comprehend how pitiful this country was less then 50 years ago. In 1960, Korea was poorer, on a per capita basis, than Iraq, Liberia and Zimbabwe, and, with hardly any natural resources or industry, its future prospects seemed dire. Yet today Korea is a proud member of the G20 and a leading manufacturer of microchips, LCD panels and automobiles. Of all of Asia's rapid-growth economies, Korea has experienced the greatest increase in per-capita GDP since the mid-1960s. Most analysts tend to credit Korea's success to the heavy role of the state in making this miracle happen. But I prefer to see the Korea story as one created by the power of globalization. Back in the 1960s, Korea's technocrats were smart enough to realize they could increase incomes at home by using their advantage in low-cost labor to export cheap manufactured goods to the industrialized world, and especially the United States. As wealth increased, the country could then afford investments in new, heavy and high-tech industries. South Korea is probably the best single example of how international market forces, if wisely tapped, can turn the poorest of nations rich in a remarkably short period of time. It's proof that no matter how destitute a nation might be (such as an unfortunate number of African countries), the right mix of policies can get growth going and incomes rising, and transform hopelessness into hope. Lesson Two: Liberalize and internationalize. When I lived in Korea in the late 1990s, there was real fear that the economy was going to get overrun by China. Chinese firms were charging hard into the industries in which South Korea specialized, such as shipbuilding and electronics, and competing with even lower costs. But Korea has managed to maintain a clear edge over China by starting to make the “leap” from a developing economy based on manufacturing stuff into a more advanced one increasingly based on innovation. Korean companies are becoming adept at R&D, branding, design and marketing. This “leap” is extremely difficult. I can't think of any other emerging market in recent years that has made it. (Japan did back in the 1960s and 1970s; Taiwan might be close on Korea's heels today). How is Korea “leaping”? In my opinion, the reason is the increasing liberalization of South Korea, across all aspects of society. When I first moved to Seoul, in 1996, the city was a tightly wound, provincial place. The country was in the early stages of democratization (the last dictator conceded to free elections in 1987) and vestiges of the old system of state control remained. The financial sector was still manipulated by the bureaucracy. Big business conglomerates were well protected by compliant bankers, regulators and government officials. Foreigners were generally unwelcome. I had to venture onto the U.S. army base, located in the middle of Seoul, in search of an American breakfast. A midnight curfew remained in force, after which all of the clubs and bars had to shut. Seoul was an interesting place, but not necessarily a vibrant one. For a nation so dependent on the outside world for its growth, Korea was surprisingly removed from it. Today, Korea is in many respects a much more liberal environment. The economy is more market-oriented after the Asian financial crisis of 1997-98 broke apart the cozy links between government, finance and business. That forced the big companies to be more independent, profitable and transparent, and laid the groundwork for the explosion of Korean firms like Samsung, Hyundai and LG in the global marketplace. More and more Koreans are educated overseas and are exposed to a wider range of influences. The economy is more welcoming to outsiders; many of the senior management posts at consumer electronics giant LG are now filled by non-Koreans, for example. The rise of “creative” industries, such as film, video games and pop culture, has filtered into the corporate world, where it shows up in niftier design and marketing. It's hard to imagine the Korean economy making these advances under the closed system imposed by the strict dictatorships of old. I can't prove that, but Korea does suggest that a more open society can become a more innovative one. Korea has much work left to do. Its companies struggle to invent the “breakthrough” technologies they'll need to compete in the future and the economy needs to become even more open to foreign investment and competition. Some of its biggest firms still must modernize their corporate management practices, as shown by Samsung Electronics today, which restored Lee Kun Hee, the current patriarch of Samsung's founding family, as its chairman even though he resigned from that post amid a scandal two years ago. But Korea is much farther down the path towards becoming an advanced, U.S.-style economy than I thought possible a decade ago. Lesson Three: Don't forget the BRICs (BRIC stands for Brazil, Russia, Inida, and China). 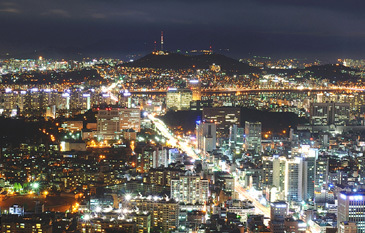 Korea shows the growing importance of links between emerging markets in today's global economy. Hyundai, Samsung and LG have been aggressive, and in most cases, early investors in India and China and are now top brands in local car and electronics markets. To a great degree, they've outmaneuvered the slower-moving Japanese in these key economies. That puts them in a position to switch from followers in the global economy, who latch onto market trends set by American or Japanese firms, to leaders, able to direct where these industries are headed. In this way, Korea is again pointing the way forward for the world's remaining poor countries. When Korea was on its drive to wealth, the U.S. was the primary source of customers. However, today's developing nations, can increasingly rely on each other to both drive growth and offer opportunities for their up-and-coming corporations to gain international prominence.